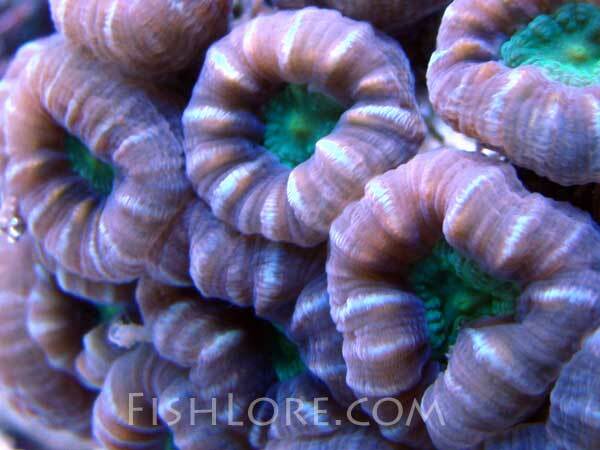 The Candy Cane Coral gets it's common name from the alternating stripes on it's polyps. This candy cane coral has a striped pattern on top of the polyp with usually a solid colored interior part of the polyp. There are a few different color variations including brown, green and cream colors, usually with alternating white stripes. Candy cane corals fluoresce magnificently under blue moon lights, making it look like something from outer space when viewing the tank at night when the aquarium lights are off. Candy Cane Coral Care is fairly straight forward. Provide moderate to high intensity lighting, give it moderate water flows and feed it on a regular basis. They are known to be remarkably tolerant of hobbyist mistakes (i.e. low salinity, low calcium levels) and usually bounce back from these mistakes well. Provided that you can give it the light it needs the limiting growth factor could become food. When the lights go off are when the little feeder tentacles come out and that is when you want to try and target feed. Turn off the power heads or other wave making devices and then with your sea squirt feeder (or turkey baster) slowly push the foods over the feeding tentacles. You can try mysis, brine shrimp and smaller saltwater origin meaty type foods. Don't over do it and pollute your tank. Just try to give them a little bit per feeding at a rate of a couple to several times per week should be fine. This Candy Cane Coral is true beauty and can be recommended as a good beginner LPS (Large Polyp Stony) coral assuming that you can might it's care requirements. Care Level : Easy to moderate. 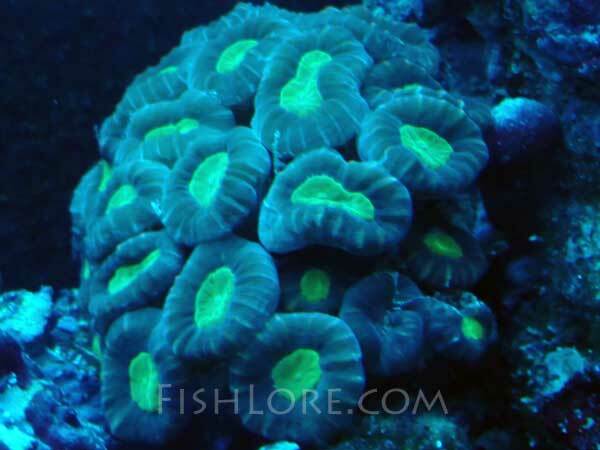 This could be considered a decent candidate if you're interested in LPS coral keeping. Moderate lighting and moderate flow with supplemental target feedings periodically needed. Origin / Habitat : Indo-Pacific, Fiji, Solomon Islands, etc. Candy Cane Coral Temperament / Behavior : This Large Polyped Stony (LPS) coral is not all that aggressive and has relatively short sweeper tentacles. Keep it away from more aggressive corals and give it room to grow. How to Frag Candy Cane Coral : This is one of the easier corals to frag. You can frag the branches as low as possible and then affix it to a frag plug or live rock. 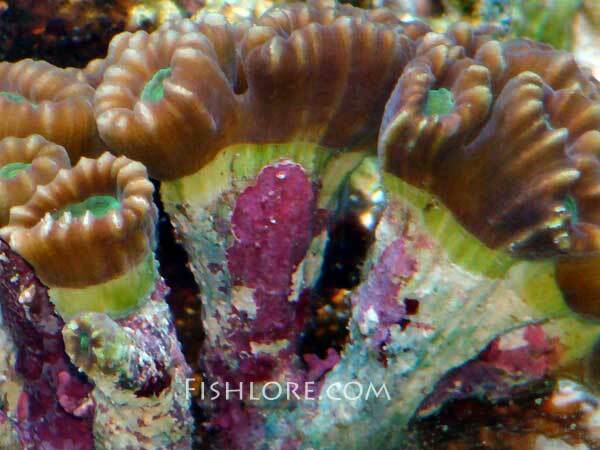 Candy Cane Coral Food : Will grow faster and do much better when kept well fed. Target feed with very small (tiny) pieces of fresh marine origin foods offered when lights are out and the feeding tentacles are extended. Gently push the food towards the feeding tentacles. Candy Cane Coral Light : Moderate to High lighting levels, with moderate being fine. T5's, VHO's or Metal Halides are recommended. Power compacts maybe, if you can place it higher in the tank. Water Movement : Moderate but not too much and turbulent flows are what you're after. You don't want to much flow are it could be more difficult for them to feed at night. - Calfo, Anthony (2007), Second Edition, Book of Coral Propagation. Reading Trees Publications. - Sprung, Julian (1999), Corals: A Quick Reference Guide. Ricordea Publishing. Here are some tips. Feed them small amounts several times a week and if you have halides or T5's put them in the middle or lower part of the tank attached to some live rock. Keep your alkalinity and calcium levels high and you should see buds sprouting regularly. 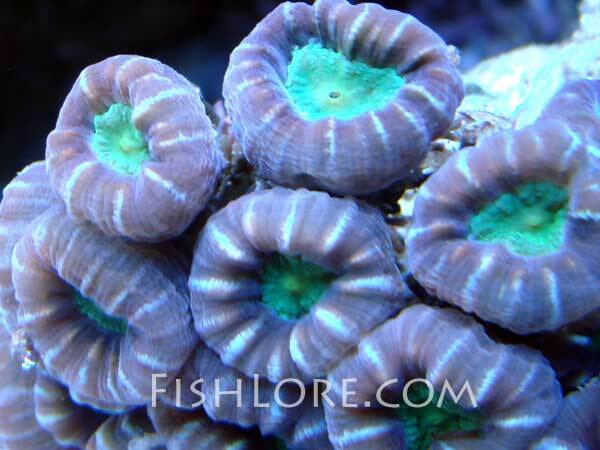 Once the polyps reach about nickel size you can frag it and share it or trade it with your saltwater friends. Tons of different color varieties available and very expensive! Several different coral species are lumped into the chalice coral common name. They need moderate to high lighting levels, moderate water flow levels and will need to be fed periodically to get better growth results. This is a fast growing and encrusting coral when given reef like conditions. Moderate to high lighting and water flows are good.